The 420 Archive is working with Americans For Safe Access and other organizations to record the oral histories of patients who use medical cannabis and their caregivers who attend Medical Cannabis conferences throughout the U.S.
420 Archive will travel to interview individuals such as those from the baby boomer generation who went to San Francisco in the early 1960’s and Northern California during the “back-to-the- land movement” to grow cannabis. In doing so, we will help capture this information before this generation is no longer living and this important oral history is completely lost. Well known marijuana prohibition activists such as Mary (Brownie Mary) Rathbun, Dr. Tod Mikuriya and Jack Herer have passed away and along with them their own stories and histories on their work to legalize medical marijuana. Many other early activist’s stories are at risk of being lost if no effort is undertaken record them. 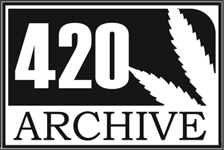 The 420 Archive will interview those on the front lines of the movement in the 60s and 70s making sure their memories of events are recorded and preserved. The nation’s historical records on the prohibition of marijuana are fragmented, scattered across towns, cities, counties and states in dozens of different organizational repositories; all variously housed. While some organizations do a good job cataloging, sorting and preserving their records, most have not due to the lack of funds and staff training on record management. Within these organizations, responsibility for collecting and curating history is understandably non-existent or a low priority. Without established mechanisms for sustained coordination and cooperation to archive relevant collections, historic records are at great risk of loss by destruction due to space needs of the organization or even by simple neglect. Our purpose for this project is to serve as a coordinating entity for these organizations, to provide training in record management to better identify and preserve potential relevant historical documents, to house records deemed unnecessary to keep and to eventually expose their holdings to researchers through a central portal.